Tuesday November 14th 1922 I fixed brown dress in AM. Hattie & I rode to town with Fannie. We got a wedding gift for Edna Price. I went to see Ella Sanders. Rode home with Ott & Fannie. The girls to a concert tonight. 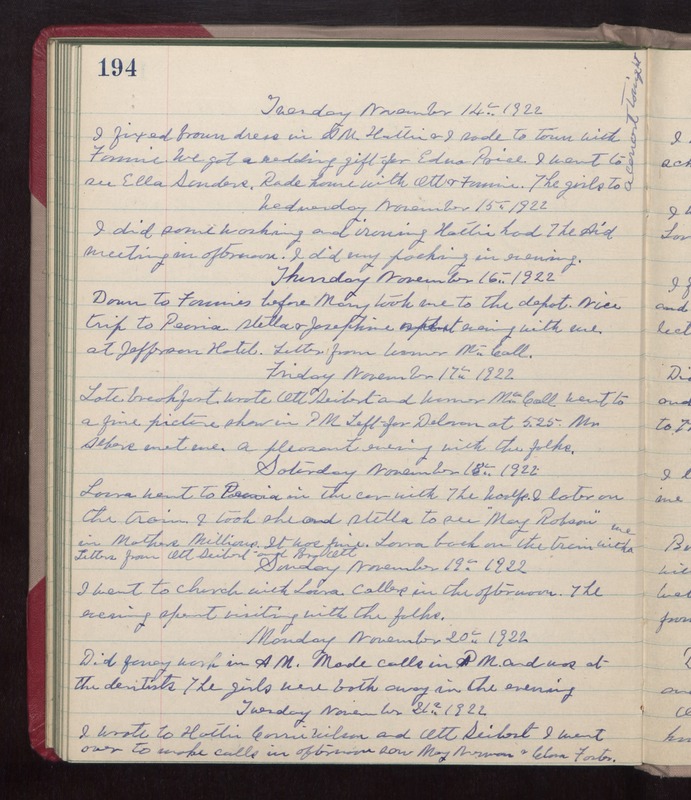 Wednesday November 15th 1922 I did some washing and ironing. Hattie had The Aid meeting in afternoon. I did my packing in evening. Thursday November 16th 1922 Down to Fannies before Mary took me to the depot. Nice trip to Peoria. Stella & Josephine spent evening with me at Jefferson Hotel. Letter from Warner McCall. Friday November 17th 1922 Late Breakfast. Wrote Ott Seibert and Warner McCall. Went to a fine picture show in PM. Left for Delavan at 5.25. Mr Albers met me. A pleasant evening with the folks. Saturday November 18th 1922 Laura went to Peoria in the car with The Woolfs. I later on the train. I took she and Stella to see "May Robson" in Mothers Millions. It was fine. Laura back on the train with me. Letters from Ott Seibert and Bro Ott. Sunday November 19th 1922 I went to church with Laura. Callers in the afternoon. The evening spent visiting with the folks. Monday November 20th 1922 Did fancy work in AM. Made calls in PM and was at the dentists. The girls were both away in the evening. Tuesday November 21st 1922 I wrote to Hattie, Corrie Wilson and Ott Seibert. I went over to make calls in afternoon. Saw May Newman & Clara Foster.